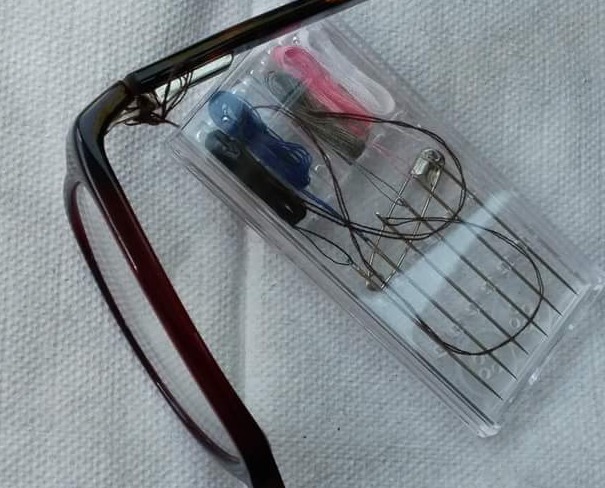 A needle and thread make a quick fix for broken eyeglasses. Photo copyright Noelle M. Used with permission. My friend Noelle was recently faced with a challenge while on travel. Her son had damaged his eyeglasses right at the beginning of the family vacation. The hinges were bent so badly that the eyeglass screw no longer fit. This left very few ways to attach the temple to the main frame of the glasses. The initial fix was the classic one – use a small safety pin in place of the eyeglass screw. Fortunately, Noelle’s daughter came up with a better solution. She suggested sewing the eyeglass pieces together! Noelle told me that the needle barely passed through the hole in the middle of the damaged hinges. She sewed several loops and then tied off the thread. The eyeglasses were slightly loose but they stayed on her son’s face. The thread loosened up and started to fray after 4 days. Noelle simply repaired the glasses again. The good news? The fix was unobtrusive and allowed the glasses to fold up for storage. This is a great solution for business travelers that want to maintain a professional appearance. It is a better alternative to the “Hey, I’m a nerd!”** safety pin solution. Think about using dental floss for your fix if you want a stronger thread. The thread stays on the inside of the frame so it isn’t noticeable to others. ** I am a complete and total nerd. I don’t always want to look that way. Yes, that’s why I mentioned it in the third paragraph. Dental floss is right up there with duct tape when it comes to useful things.